Will The Needs Of Long-Term Survivors Be Heard? 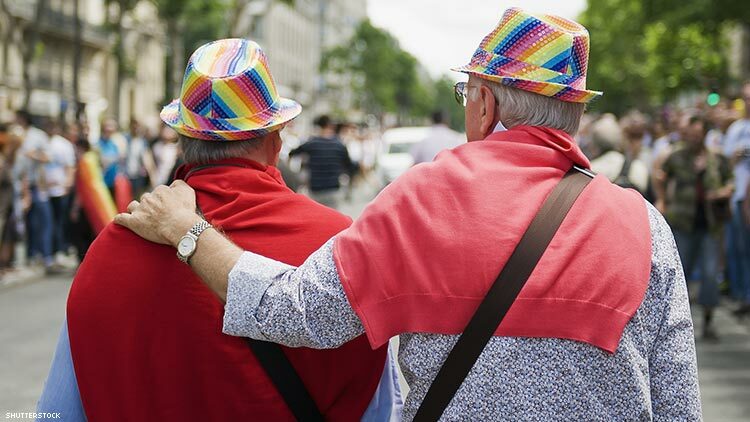 Aging HIV-positive people were missing from IAS 2017 in Paris. Let's hope history doesn't repeat itself in Amsterdam. Last summer, at The 2017 International AIDS Society HIV Science conference (IAS 2017) in Paris, it was hard not to notice an absence of data on accelerated aging and co-morbidities affecting long-term survivors. The event was empty of the testimony of the early years of this epidemic, of those witnesses who were not so long ago young brave activists themselves, and with them, a clear focus on the issues effecting this population. We look back now and ask if resolve is giving way to the adoption of sufferance that comes with age. Paris being empty of the acknowledged presence of long-term survivors at IAS 2017 may contribute to why most of the research on HIV and aging was sparse and relegated to poster sessions without any consternation. What we did learn at the conference about accelerated aging and HIV comorbidities barely scratched the surface, and only affirms the need for more studies. From the HIV HEART Study Group, we discovered that earlier cardiovascular events were higher and overall survival was shorter in people living with HIV and AIDS (PLWHAs) compared to the general population — particularly in males. In a large French cohort of individuals approaching the age of 50, researchers found cardiovascular disease, including hypertension, and renal disease were more common in PLWHAs than in the general population. And from AIDS Clinical Trials Group A5322, we saw data on the association of cardiovascular risk factors in a cohort of older PLWHAs. Amongst older PLWHAs with well-controlled cardiovascular risk factors, higher HDL was associated with better cognition ability. The issues of accelerated aging and the multiple comorbidities affecting the gut, organs, and metabolism were largely ignored at the 2017 IAS Conference. This is also apparent at AIDS 2018 from the lack of dedicated plenary sessions — where the most important and pressing issues are discussed, demonstrating that a clear focus on accelerated aging and HIV comorbidities is sorely lacking, placing people living with HIV at a morbid disadvantage. Over 60 percent of PLWHAs over the age of 50 are experiencing HIV-related comorbidities, co-infections and accelerated aging. With numerous comorbidities and conditions now impacting PLWHAs, the number of medications or poly- pharmacy has increased. An alarming trend is emerging that may require potential repositioning of HIV research priorities, funding, policies, and treatment guidelines on accelerated aging, currently neglected co-morbidities, and the associated poly-pharmacy that accompanies growing older with HIV. However, there’s growing concern that proportionate attention isn’t being paid to these issues. It almost appears as if there were some diminishing social and scientific obligation to maintain relevance for the evolving changes in HIV science and treatment. Studies from this past year on accelerated aging and HIV comorbidities and the poly-pharmacy, which accompany them, only serve to strengthen this concern. A second study published in the June online edition of the Journal of Acquired Immune Deficiency Syndromes addressing poly-pharmacy in HIV-positive people, reported that half of people over 50 were at risk of drug interactions between ARVs and other medications. Women had higher risk of interactions, as did those on ARV regimens containing protease inhibitors. Data published this February in AIDS Care of a second study conducted by the Veterans Administration, demonstrated that GI comorbidities are a serious concern for PLWHAs on ARVs and contribute to the disproportionate poly-pharmacy and non- adherence. While Mytesi, the only FDA-approved drug proven effective for alleviating ARV driven diarrhea, is becoming more widely used, data suggests that Cohen’s disease, Irritable Bowel Syndrome (IBS), and inflammatory bowel disease (IBD) are becoming proportionate, as PLWHAs live longer, to their incidence in the general population. CD4 lymphocytes mediate disease expression in both HIV and IBD. The incidence of ulcerative colitis in HIV is about double that expected in a normal population. Data also indicates that there is no clear association with CD4 counts and the time of diagnosis of IBD, and that a decrease in the number and function of CD4 cells in PLWHAs can facilitate the development of IBD. Clinical studies have postulated that a progressive decline in CD4 counts caused by HIV may reduce disease activity in IBD and could contribute to remission. The complications associated with drugs for these comorbidities are extensive. Use of several drugs for these conditions are linked to increased risk of contraction and lymphoma. According to one review, “Long-term use is associated with increased risk of [contraction] and the metabolic consequences of corticosteroid use (like bone loss) that have the potential to exacerbate the metabolic syndrome characteristic of chronic HIV.” Two of the leading drugs used for these conditions, Remicade and Humira, are immune suppressive and a third, Entyvio, increases the risk for Progressive Multifocal Leukoencephalopathy (PML), a deadly brain infection affecting HIV patients. Lodonal, a novel formation of low-dose naltrexone in development by Immune Therapeutics, which in a phase II study in Crohn’s disease demonstrated significant improvements in symptom relief, may be an option for PLWHAs with these conditions. Other studies on Lodonal in HIV demonstrate that a direct correlation exists between declines in gut inflammation and modulation of immune hyper-activation, one of the most compelling issues of the HIV cure research agenda discussed at IAS 2017, with new data expected in 2018 in Amsterdam. Several studies on Lodonal in HIV have also demonstrated significant immune modulation that had a direct benefit on enduring CD4 recovery attributed to decreases in inflammatory cytokines that are also present in people with IBS, Crohn’s, and IBD. It has long been established that the gut is a target organ for HIV and contains the largest pool of CD4 cells in the body. Another study being conducted at Boston Medical Center and St. Petersburg University, in collaboration with the NIH, is investigating low-dose naltrexone to address inflammation and pain in PLWHAs who abuse alcohol. Also of interest, ABX464 (ABIVAX), a novel drug in phase II development targeting HIV REV, is also currently being studied in Crohn’s Disease, IBS, and ulcerative colitis. Results of initial studies demonstrate that its inflammatory mechanisms seen in HIV are identical in IBS. Crohn’s disease in people living with HIV is demonstrating how viable therapies for neglected and emerging comorbidities of HIV and accelerated aging is becoming a defining issue when ARVs have increased life expectancy. The studies of Lodonal in Crohn’s, following the development of Pitavistatin in the REPREIVE study, are examples for customizing management of comorbidities — which develop as we live longer, develop conditions that are unrelated to HIV, and require medications that will further challenge the idea that HIV is now a chronic manageable illness. If we’re going to provoke the improvement of clinical interventions for managing predictable comorbidities in the grey era of HIV at AIDS 2018, we have to demand drugs that present superior outcomes for people with HIV experiencing earlier onset of age-related diseases and the means to successfully manage the serious adverse events (SAEs) undermining the extended survival rates facilitated by the evolution of ARVs.